We’re grateful for the many people who worked behind the scenes to bring Winged to life. This week, we feature short interviews with two of our visual artists, Charlotte Clement and Megan Newell. Here’s what they had to say about their interest in pollinators, their work as visual artists, and why they chose to join our team. Thanks, Charlotte and Megan! I’m an artist and beekeeper based in Portland, Oregon. I was born in Rhode Island and studied fine arts at Drew University. I became became involved with Winged through Jill McKenna Reed. I work with Jill at Bee Thinking. 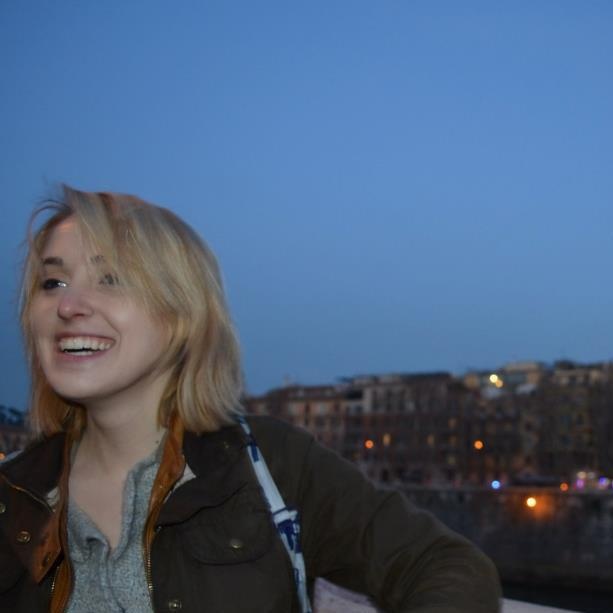 I am excited to be a part of Winged because I’d like to do whatever I can to help bees. I started working at Bee Thinking and became a beekeeper around the same time. I’ve spent the past year having long conversations about bees, their dire state, and the impact their state will have on all of us. Winged was a great opportunity to contribute to a cause I care for through a means that I am very familiar with: drawing. 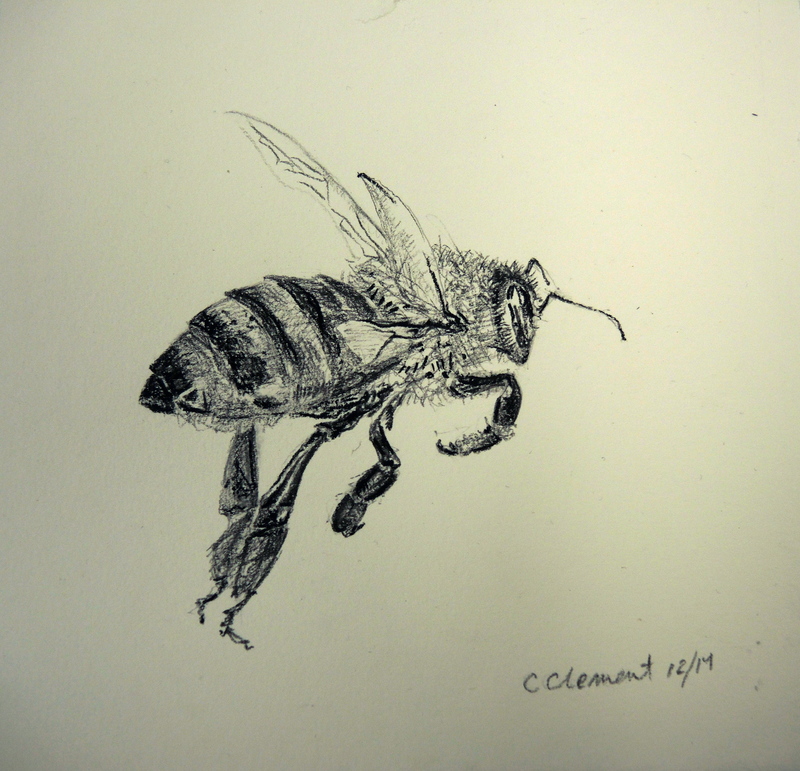 Honeybees have in some way shifted my art and creativity. I am inspired by their comunity structure and architectural skill. I used to make a lot of vessels using latex and paper mache. My projects were quite similar to the aesthetics of a beehive. In addition to managing Bee Thinking’s retail space, I also assist ceramic artist Kim Murton. 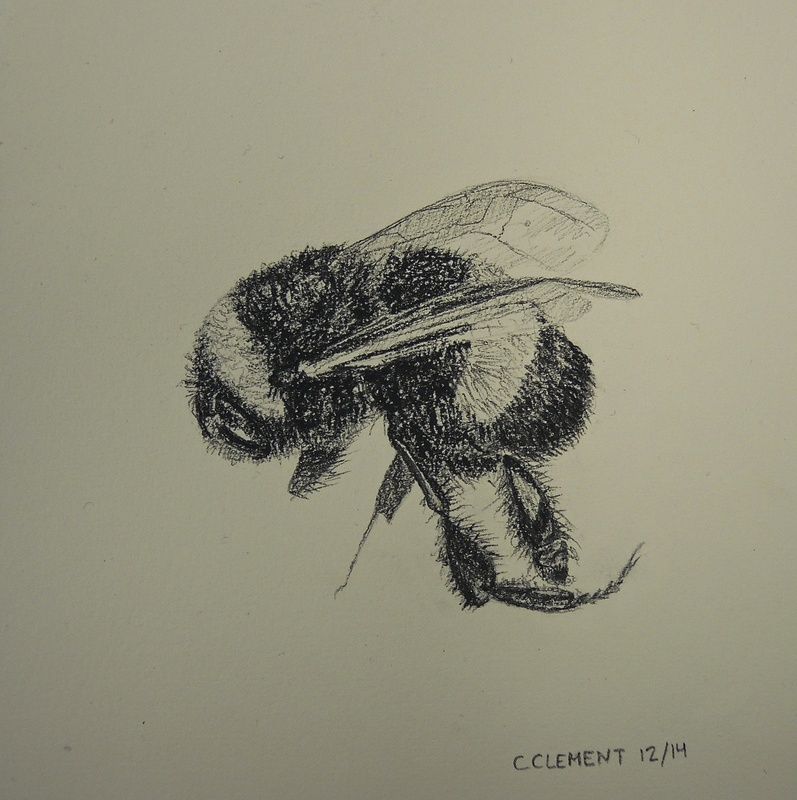 These interests continue to inspire my art, which is recently focused on textural drawings of bees. I usually work in graphite and charcoal. Apart from their environmental implications and communal living, I find the movement of the bee most interesting. I am fascinated by their ability to travel for so long on so little and how their wings are simultaneously invisible and luminescent. I tried to capture a moment of that speed and delicacy in my work with Winged. The opportunity to design for Winged is exactly the reason why I design–to support an issue I believe in by helping create the visual storyline. I also value the coming together of writers, poets, artists, photographers, readers, and bee lovers to create a piece that celebrates the beauty of life, and more particularly, one small and important creature. I want to help bring attention to declining honeybee populations, and I am honored to have been a part, although just a small part, of the creative response to this serious issue. I feel my purpose as a designer is to make others’ lives a little lighter and brighter, even if for a moment. This often influences my work to be vivid, multi-colored, fun, layered, textured, and engaging. As someone who prefers to listen than to speak in conversations, a design becomes my voice to the ideas that form in my mind as I observe others’ passions, histories, issues, concerns, and humanity. I am available for projects and/or collaborations! You can reach me at megz.newell@gmail.com and view previous projects at www.megannewell.com. Last summer when my fiancée Lauren and I pulled up to the prairie, bees boilingly hummed around our bee club’s hives as our wedding planning swirled in my head. We had driven to the prairie to check on the bees’ honey production. From the gravel lot, the bees danced from the adjacent alfalfa field to their hives that we would open up. Earlier, in spring, I had proposed with my grandmother’s ring. 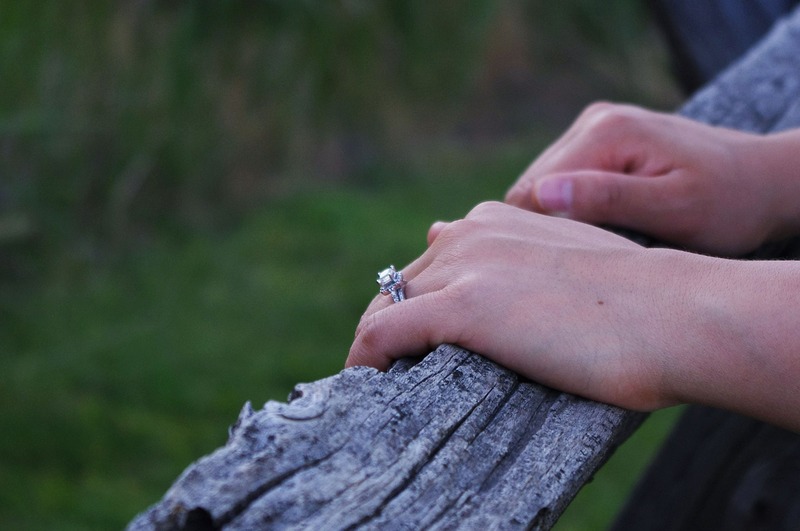 The simple silver band with a diamond stud fit Lauren’s finger perfectly. Around the same time, we had joined the bee club and took a class with Arvin, the apiarist at the horticulture farm for the university where I teach. For several Saturday mornings the club met in a room with a radiator that pinged. During the meetings, I thought about the countdown until the wedding and all the planning to do. Lauren had a yearlong list that we were checking off. The list noted things to do months (dress and tuxedo), weeks (rings), and days (marriage license) leading up to the wedding. Lauren and I were planning on inviting both our families in Florida, more than one hundred people, and that meant a band, catering, venue with enough parking, and ordering cards for RSVPs and Thank Yous. The ceremony had become more for our families than about us. We had already been together for several years but knew we wanted to commit to being together for the rest of our lives. We met where we had grown up: Central Florida—multiple cities that sprawled over orange groves and swamps. It took either 15 minutes or 45 minutes to drive anywhere, and mostly via toll roads. Nobody made eye contact in the suburbs as owners’ dogs left turds on lawns. My boss chewed me out in front of customers at the restaurant where I worked, and Lauren filed accounting and blueprint plans for a construction firm that paid her as an intern. Lauren had moved with me when I entered grad school. 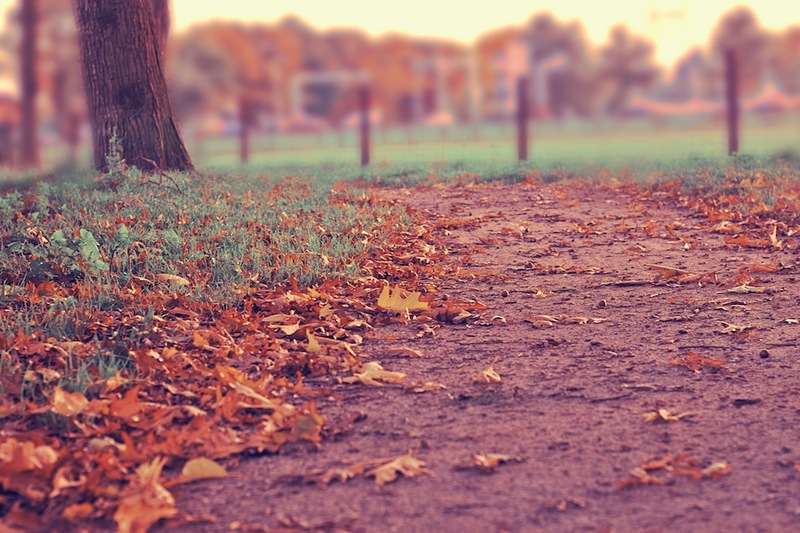 We came to love our quiet, simple life in the Midwest. From the sidewalks, our neighbors said, “Good morning.” Lauren rode her bike to work for a non-profit. People on the bus gave their seats to older folks. In class, my students shook my hand. We belonged to a co-op grocery store and made meals at home each night. In the prairie, I considered that we probably wouldn’t have discovered—let alone had the time for—a bee club in Central Florida. At a shed, Lauren and I put on bonnets and then walked over to the white boxy hives. Throughout summer the club had added levels of “supers,” stacking the hives into miniature towering apartments. Lifting the roof, I squeezed a smoldering smoker’s accordion-like pump filled with smoldering burlap. Lauren used a beebrush to wipe off the frames with “the ladies” (as Arvin called the all-female workers). I scraped and pried the gluey propolis off edges with the crowbar-like hive-tool. I pulled up a heavy frame with uncapped comb oozing honey. As the bees rose in a smoky stupor, my thoughts on the wedding cleared. We were getting married for the continual days together that would fill with moments: playing rummy at the kitchen table, pouring water along the rows of our backyard garden, watching the green flickers from lightning bugs through the screened windows, huddling under the basement stairs as the tornado sirens wailed, wearing hats inside the house during winter, and dabbing our fingers in the first taste of tens of thousands of flights. This essay first appeared in Edible Iowa River Valley. gemstone from the Dominican Republic, warm light of hope. How bees pollinate the squash, pears, vegetables, herbs and spices. How the honeycombs are lit from within, pure chroma color. hexagonal, the esoteric shape of bees’ bodies. with a wooden spoon, adding a bit of Mediterranean sea salt. Gwendolyn Morgan learned the names of birds and wildflowers and inherited paint brushes and boxes from her grandmothers. With a M.F.A. in Creative Writing from Goddard College, and a M.Div. 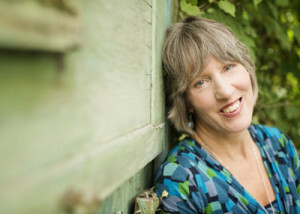 from San Francisco Theological Seminary, she has been a recipient of writing residencies at Artsmith, Caldera and Soapstone. 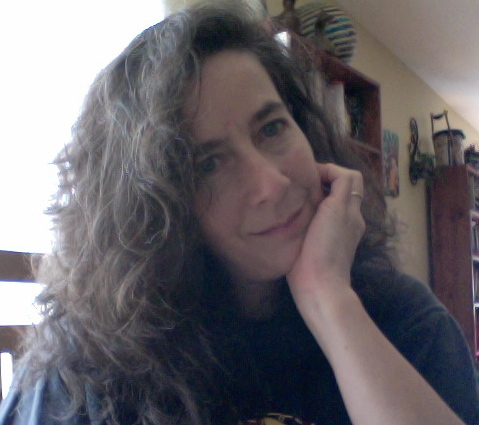 Her work has been published in: Calyx, Dakotah, Kalliope, Kinesis, Manzanita Quarterly, Tributaries: a Journal of Nature Writing, VoiceCatcher, Written River as well as other anthologies and literary journals. Crow Feathers, Red Ochre, Green Tea, her first book of poems was released from Hiraeth Press this past autumn. 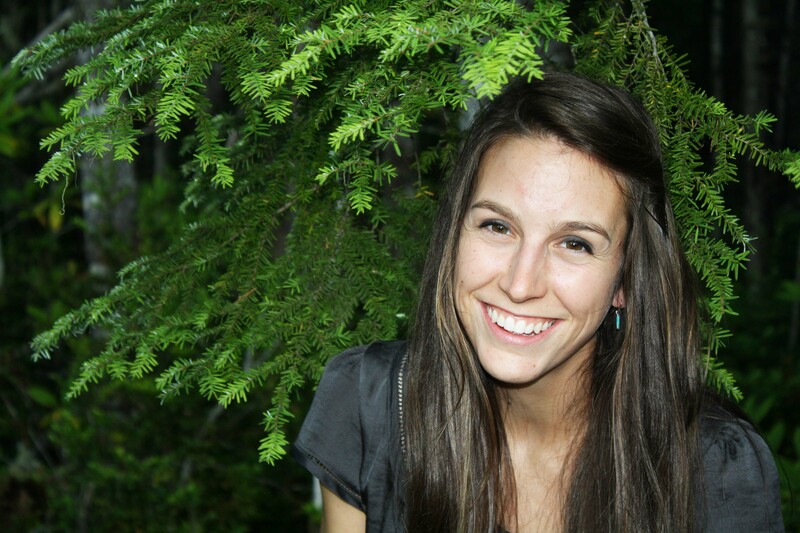 She serves as the manager of interfaith Spiritual Care at Legacy Salmon Creek Medical Center. Gwendolyn and Judy A. Rose, her partner, share their home with Abbey Skye, a rescued Pembroke Welsh Corgi. For more information, please visit her website. in my silence, I rubbed buttercup pollen on my cheeks, tied dandelions into ropes. right as the heavens ripped open, before he was silent for forty days. my whole body trembled. I was speechless. pointing your people to the wild, wild nectar of endless yellow blossoms? 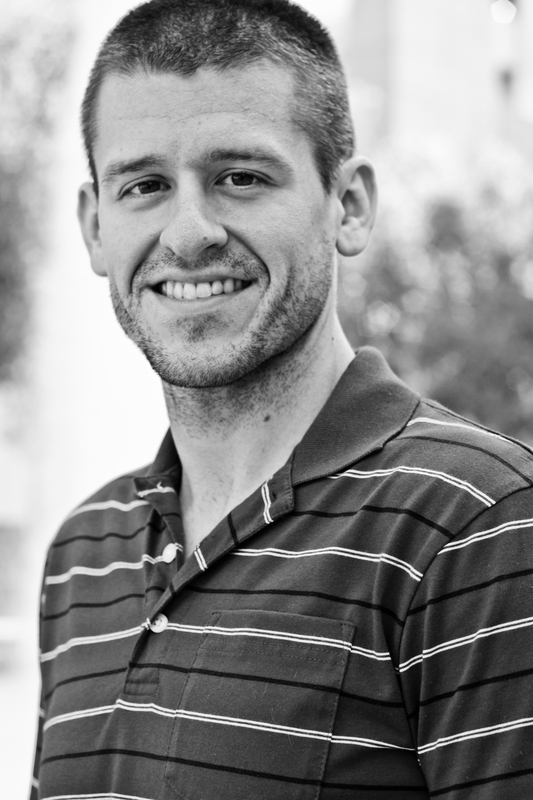 Travis Poling is a poet, liturgist, and teacher living in Richmond, Indiana. chapbook. 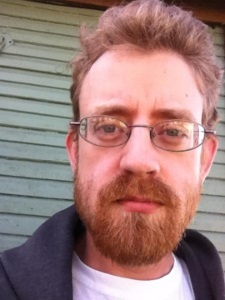 He edits the William Stafford Online Reader and blogs at travispoling.com. 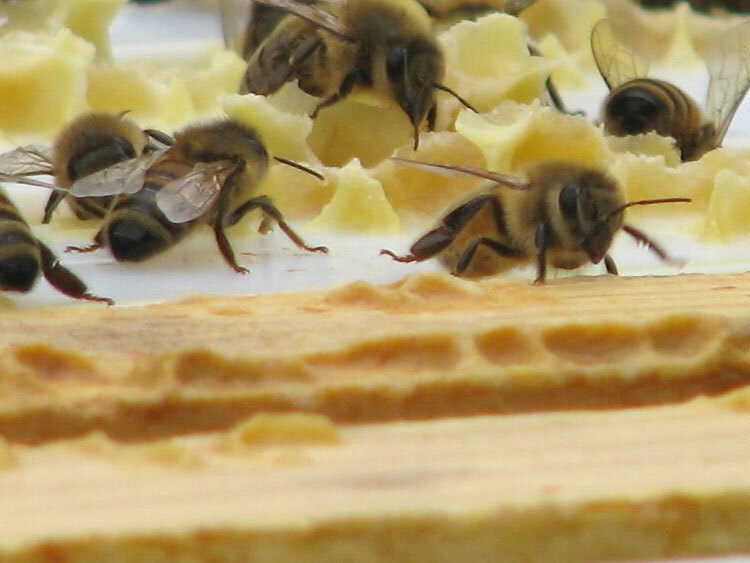 exploring the honey bee in ecological and spiritual traditions. were literally connected through the vibrations of sound. spiritual matters, the mystery led to many questions. and growth of the group). That’s why this particular moment at this particular jazz show felt so vital to me. humming wings of those around me. For a brief and powerful moment, I was literally a worker bee at rest in a hive. Street Cafe is similar to that of worker bee with beehive. into a place of strength and beauty and empowerment. I carry their spirit with me to this day. multi-media online literary zine. She can be reached at monava9@gmail.com. 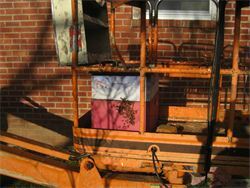 An amazing post from treatment-free beekeeper Kat Nesbit of Bliss Honeybees. Written two years ago, this is the story of two intrepid beekeepers called to remove a feral honey bee hive from a public building. It’s an incredible first-hand look at these creatures, and Kat’s creative approach to moving the hive. For more on Kat and Bliss Honeybees, including this year’s Treatment-free Beekeeping conference, please visit her website. Yesterday afternoon I went to the Veteran’s Administration complex in White City, Oregon, to remove a hive from a 2nd story roof with my friend John. 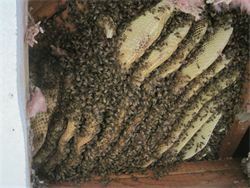 They didn’t want to tear up the roof, so the plan was to go in from the ceiling of the hall below the hive. When we arrived we found they had quarantined the hall where the bee removal was to take place. It reminded me a little bit of the scene at the end of ET where the feds have come in and put ET in a plastic prison to keep the public “safe”! They had already cut a hole in the ceiling, from which fluffy clouds of insulation were emerging like really nasty cotton candy. We needed to expand the hole to completely expose the nest, which we did with a reciprocating saw. It’s the first time I’ve been in a beehive since December and I could feel my heart start to beat faster in awe and appreciation of what these amazing little creatures can accomplish. Since the VA had access to a lift (like the kind that construction workers or painters use to work at elevated sites), we decided to situate the lift right outside the 2nd story window. I climbed out the window and set up my work station in the narrow cage. John stood on a ladder inside and cut the comb out of the nest, then handed it teaming with bees to me on the lift. I brushed the bees off into the box with a bee brush, cut the comb down to fit the frame with my hive tool, and rubber banded the comb into frames. 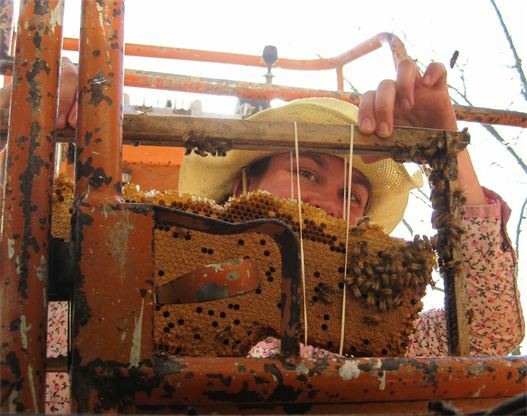 Over time, the bees will chew through the rubber bands, attach the combs to the frame, and fill out the empty spaces. The bees standing on the top of the frame in this photo are sending out a “come hither!” scent to the other workers to tell them where to rejoin the colony. To do this, worker bees have a special scent gland called the Nasanov gland on the dorsal side of the abdomen. The opening is located at the base of the last tergite (plate) at the tip of the body. The bees raise their abdomen and tip the very end of to expose the gland, then fan like crazy with their wings to send the pheromone out into the air. Bees have an excellent sense of smell and can follow this scent to find their sisters. 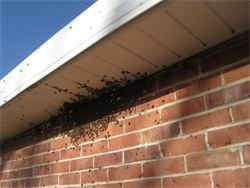 This 2nd photo shows the same bees zoomed in. This photo shows the outside entrance to the hive, where returning foragers are milling around in confusion as they find their home gone. Once we cut all the combs out, the VA lowered the lift so I could get out. Then we sent the hive back up on the lift and situated it as close as possible to the original entrance so that the bees remaining in the roof and the returning foragers would smell their family and join them in the box. Hopefully this included the queen, as I’m not at all sure that we got her. Neither of us saw her, and the bees that were fanning at first soon stopped, which makes me think the queen wasn’t in the box. John returned after dark once all the foragers had returned to pick up the hive and vacuum up any remaining stragglers in the original nest (they can then be shaken into the box, usually unharmed).